Pre-formulation activities are arguably the most crucial part of the development process. 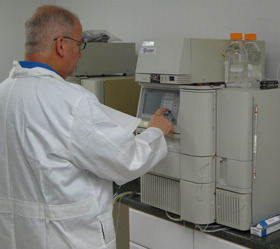 In that these activities will determine which process and delivery method will provide the most stable form of the drug. Our scientists analyze the chemical and physical properties of a molecule, which provides essential information on the drug's stability. From which, we can help determine if factors such as packaging, temperature and the reactivity to certain additives combined to make the end product stable. At Sterling we exercise a variety of pre-formulation processes to ensure that your unique CMO needs are met with comprehensive analysis that is in compliance to GMP and other regulatory guidelines. Furthermore, we provide a balance between a risk-based and process-based formulation approach to address and mitigating threats to the product’s quality. Prior to submitting a new or existing drug for clinical trials, know that your CMO has taken thorough measures to ensure drug’s stability.